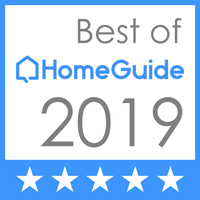 San Diego Office Design was named BEST OF HOME GUIDE 2019 in their top 10 category. Although 90% of our interior Design projects are commercial, we have a highly procured group of bespoke residential projects in our portfolio as well. We have completed a super luxurious and high-tech Home theater, a state of the the art home fitness center/ home gym, and a few home libraries and home offices. San Diego Office Design is listed on the HomeGuide network to connect with homeowners looking for unique and captivating spaces that have a special focus. We don’t design typical kitchens, bathrooms and bedrooms (there are hundreds of design firms that do a great job with those already serving the market.) We prefer to focus on the spaces that take a unique skill, special expertise, and elegant finishes. We tend to work with homeowners that are looking for something extraordinary. When you’re looking exceptional interior design for your home, we are the unexpected specialists.